When the term ‘white-collar factory’ was coined a few years back, it indicated a very contemporary kind of hot-desking, internet enabled office space that offered maximum desk utilisation for minimum cash. But we’ve all subsequently learned that the new, open-plan, hyper-networked employee ‘hubs’ tend to be all about making the bosses/landlords rich and the workers miserable: slick, 21st-century sweatshops, packed with IT-monkeys glued to their laptops. And if the global corporates want to throw in a running track, slides or a bean bag strewn den, it’s only to ensure that the employees stay longer and work harder. 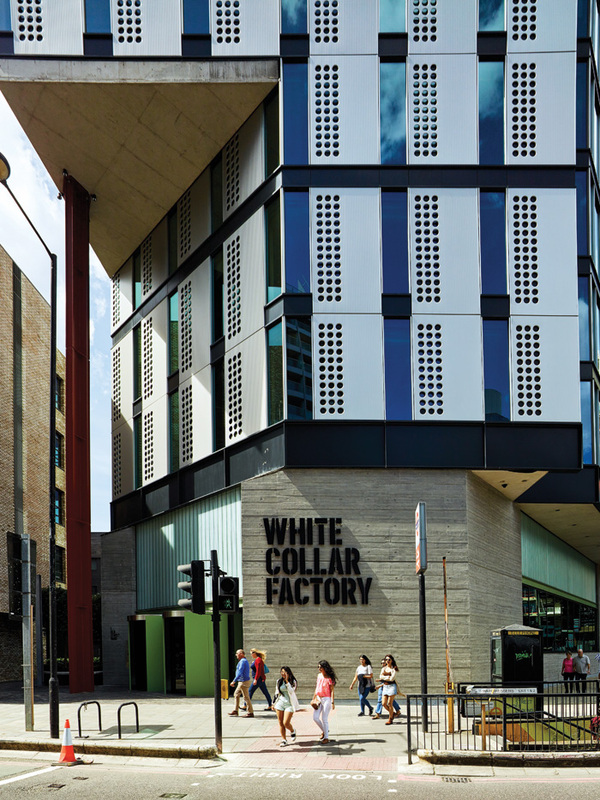 There has been a fair bit of hype about AHMM’s White Collar Factory from the time it was first touted, as an unusual, architect-led collaboration between AHMM and long-term developer client Derwent. Now it has opened, on London’s Old Street roundabout, billed as a combination of super-flexible office space combined with residential, retail, fitness and fraternising spaces; like a Google campus but for ordinary (albeit affluent) mortals. The resemblance is not accidental, given that AHMM was – until last year – designing Google’s HQ in London, but was bumped off the job in favour of a flashier building by Bjarke Ingels Group and Thomas Heatherwick. First impressions do not bode well: there are two muscled, black-clad ‘heavies’ in the lobby. One wears leather trousers and is straddled across the entry gates as if fending off the great unwashed from an exclusive nightclub. 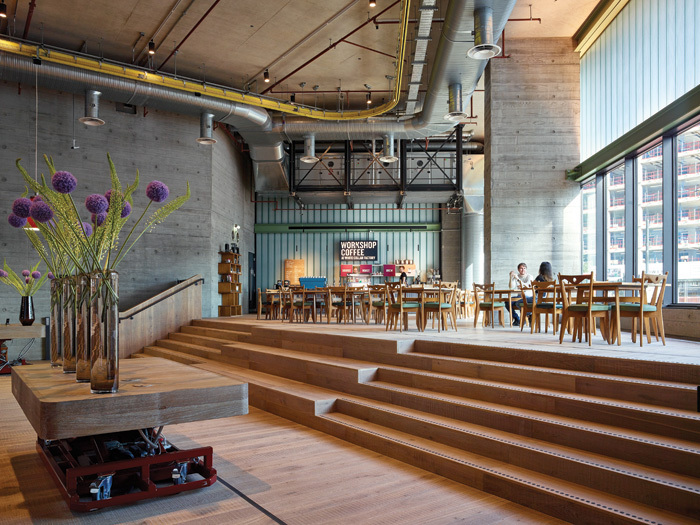 The cavernous lobby itself boasts all the tick-box acoutrements of every Shoreditch hipster hub space – crafted concrete walls, waxed wood floorboards, mid-century modern furniture, vast, industrial ceilings adorned with wacky yellow running tracks. But then AHMM director Simon Allford starts sharing his vision for the space and it becomes clear that this scheme is more than a cynical ploy to sell square footage. There is a more civic intention afoot: it’s a bold stab at fighting back against bad speculative office design. Having masterminded a number of Victorian warehouse conversions for Derwent, eight years ago AHMM started brainstorming what an ideal new-build office might look like. When the Old Street site came up, there was planning for a 16-storey tower block, which clearly didn’t match this ideal, but AHMM adapted its model. Allford’s inspiration was French architect Jean Prouvé, whose designs were all about logic, balance and purity (in tribute two Prouvé sculptures hang in the lobby). Even though the best views are to the south, AHMM has stuck to its guns, using perforated aluminium panels in their densest configuration on the south elevation. Though the panel system looks a little clunky and Meccano-esque from the outside, inside the system is both effective and elegant, with the perforations working both to frame the views and throw pleasing shadows on to the otherwise restrained interiors. With each floor stripped back to its core, every inch of space is utilised. The lift and stair lobbies are left open, partly to encourage stair use and partly to create continuity with the adjacent rooms (quick-release fire doors tick the health and safety box). Glazing in and around the lift shafts turns a boring wait into an opportunity to admire the view. A further innovation is the invention of a Concrete Core Cooling system (CCC), with chilled water circulating via pipes embedded in the floor slabs, which provide radiant cooling and thermal mass to absorb heat generated in the office by computers and lighting. Windows are openable, to give users maximum control over their environment, and each floor can be configured a multitude of ways. This flexibility extends to the enormous lobby space, where the reception desk and other tables are on wheels and jacks, so they can be raised or lowered as required or removed to turn the lobby into a huge event space; glass doors onto a new public plaza can be opened too. This new plaza connects the six buildings that comprise the whole new Old Street Yard development, adding smaller studio spaces, some retail units and nine apartments to the mix. New alleys and passages establish strong connections to the surrounding streets. There is clear respect and consideration for contexts, urban, aesthetic and social. And there are some lovely details in the building: the circular perforation motif extends from panels to portholes and right down to fat, Smarties-style wooden push points on the glass front doors. Handrails and staircases have a robust, craftsmanlike quality. There is ample provision for cyclists including parking for 300 bikes, a 150m running track on the roof, as well as funky roof terrace bars/cafes. And all for an impressive £193 per sq ft, which makes it 15-20 per cent cheaper than the equivalent standard building. Energy and running costs are also between 10-33 per cent lower.